In North America, cranberries are one of the most festive foods of the colder half of the year. The most popular fall flavors are apple and pumpkin, and the taste of Christmas is an even mix of gingerbread and peppermint, but cranberries work their way into recipes that are eaten throughout all of the fall and winter holidays. These brilliant red berries also happen to be loaded with vitamins and antioxidants that are great for our health, so they are a fall flavor that both we and our doctors can get behind (that is, assuming you manage to eat some whole cranberries and not just jellied cranberry sauce!). But cranberries are not just limited to festive foods like cranberry sauce, tarts, and cookies smothered in frosting. Dried cranberries are a common ingredient in our favorite trail mixes and salad toppings, and cranberry juice is one of the go-to home remedies for a urinary tract infection. Most of us probably could not eat plain raw cranberries the way that we would eat a bowl of strawberries or blueberries, but health enthusiasts find ways to make them palatable, and the rest of us often enjoy them in their dried or cooked state. They’re healthy, after all! But are they healthy for our pets, too? Hamsters eat food that already looks like trail mix, so it seems reasonable that the nuts and fruits found in human trail mixes would be suitable treats for our furry friends. Is it okay to pick out a couple dried cranberries for them? Can you give your hamster cranberries? 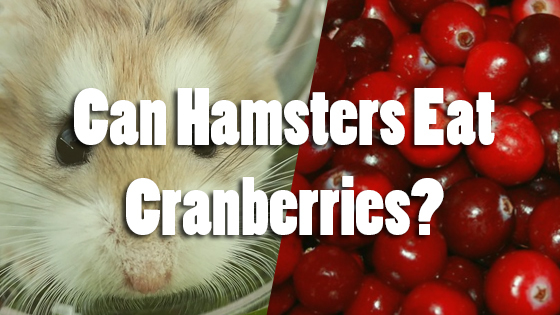 The answer is yes, hamsters can eat cranberries in small quantities, but it is important to pay attention to the way that the cranberries are prepared—the dried cranberries you find in your bag of trail mix are often covered in table sugar, which can be unhealthy for hamsters if they eat it in significant amounts. Though they are quite bitter and your pet may not enjoy them, fresh, raw cranberries are one of the healthiest fruits you can include in their diet. You can give your hamster fresh cranberries as often as you would feed them any other fruit—a small amount every day or two—but it would be wise to limit dried, sweetened cranberries to whenever it is time for dessert. Though they are not quite as trendy as acai berries or kale, cranberries meet all of the criteria to be included in the superfood category. They are very low in calories compared to many other fruits, yet they are packed with dietary fiber, Vitamin C, and powerful, disease-fighting antioxidants. In terms of antioxidant concentration, cranberries beat out almost all of our superfood staples, including spinach, cherries, red and green grapes, and even broccoli. Vitamin C is usually touted as the cold-busting vitamin, and it may help keep your hamster’s immune system working properly, but your hamster should get plenty of Vitamin C eating their standard diet. 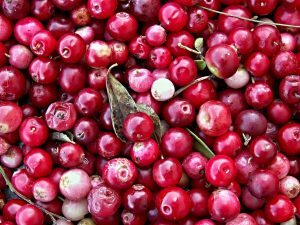 The real benefits of cranberries lie in their arsenal of phytochemical compounds. The phytochemicals found in cranberries (especially the phenols that exist in large quantities in fresh, raw cranberries!) and other fruits and vegetables are powerful antioxidants that protect your hamster’s health on a cellular level. Antioxidants are believed to prevent and fight disease by neutralizing dangerous, highly-changed waste products, called free radicals, in the body. There are many factors that can increase the amount of free radicals in your furry friend’s body at any given time (including poor diet, physical and emotional stress, secondhand smoke, and other environmental factors), but a certain number of them are inevitable—normal, healthy metabolic processes like breathing and digestion produce free radicals as waste products. What’s so bad about free radicals? Because they carry a high charge, they tend to steal electrons from other particles. This is fine in a petri dish, but inside of your hamster, the electrons they steal often belong to your hamster’s body cells! Some of these interactions are relatively harmless, but others can cause damage that is significant enough to kill the cells. Sometimes, free radical activity can even cause genetic mutations, which can lead to diseases like cancer. Antioxidants neutralize free radicals—that is, they can give electrons to free radicals without becoming free radicals themselves. In doing so, they effectively ‘disarm’ these volatile particles, preventing them from causing damage to body cells. One study found that hamsters who consumed antioxidant-rich beverages (in this case, green tea and berry juice) were less likely to develop atherosclerosis. Antioxidant-rich foods like cranberries are not a substitute for actual veterinary care, and they will not prevent any disease, but they may be able to lower your hamster’s risk of developing certain illnesses. Because they can curb inflammation, cranberries may also be useful supplementary foods for hamsters suffering with diseases like arthritis. By reducing inflammation, they can alleviate joint swelling and pain, which can improve joint mobility and quality of life. Though cranberries are one of the best fruits you can give your hamster, they still have to be given in fairly small quantities. Most of your hamster’s diet should consist of store-bought hamster mixes. Overdoing fresh fruits (no matter how healthy those fruits may be!) can cause upset stomach and diarrhea in the short term. In the long term, they can contribute to more serious health problems. Hamsters are tiny creatures who are very vulnerable to the negative effects of sugar. If they eat too much fruit, they will gain weight and may end up obese, which greatly increases their risk of cancer, heart disease, insulin resistance, and arthritis. Many hamsters are especially prone to diabetes, which means that we as pet parents have to be even more careful when we feed them sugary foods such as fruit. In conclusion, cranberries are a great option for healthy adult hamsters who are already accustomed to eating small amounts of fruit. They are relatively low in calories, high in fiber, and packed with disease-fighting antioxidants. Just remember that hamsters can only eat small amounts of fruit at a time, and make sure that your pet doesn’t start to pack on weight! Can Hamsters Eat Cucumbers? Can Hamsters Eat Crackers?